It doesn’t get any better than fresh bread! Bread is something my mom usually made at home (I stuck with the dinner rolls!) so I’ve never been very confident with my bread making abilities but wasn’t sure what I was doing wrong. 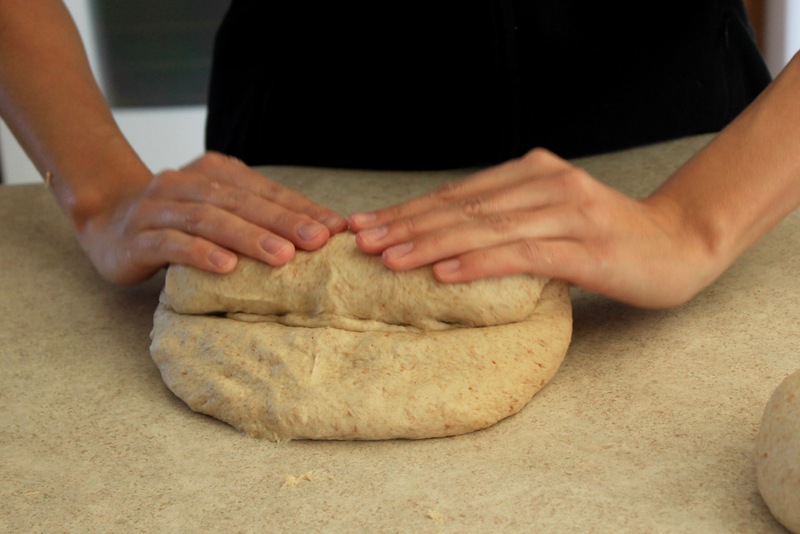 I invited a friend of mine, Rebekka, over to make it so that I could watch and learn the art of bread making. 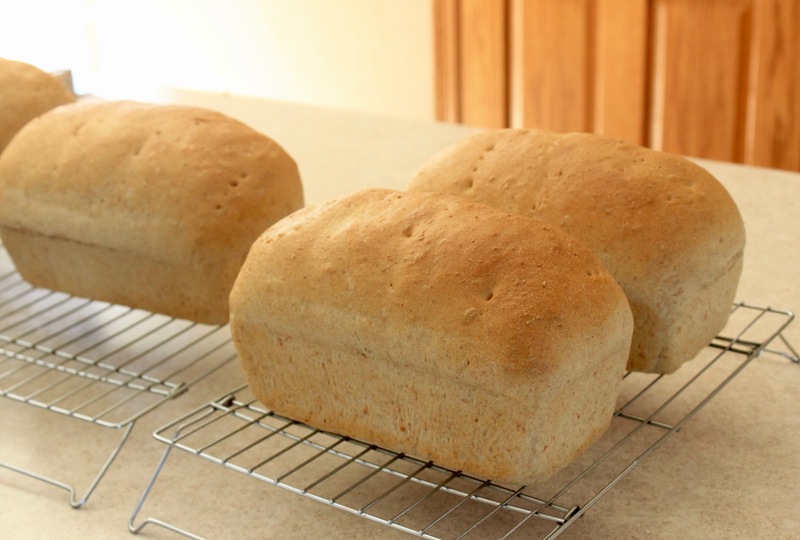 Here’s what I learned: some special people are just born with the gift of bread making while others of us have to struggle……. and try…… and try again……. and slowly over time, the art can be developed. I’m holding onto the hope that “practice makes perfect”. Rebekka (Van Ammel) Yoder is originally from Belgium where fresh bread is a part of daily life. (Why don’t we live there? Where there’s a bake shop on every corner and the scent of fresh bread fills the streets….wouldn’t that be heavenly?) I’ve watched her make bread a few times and she’s a pro! 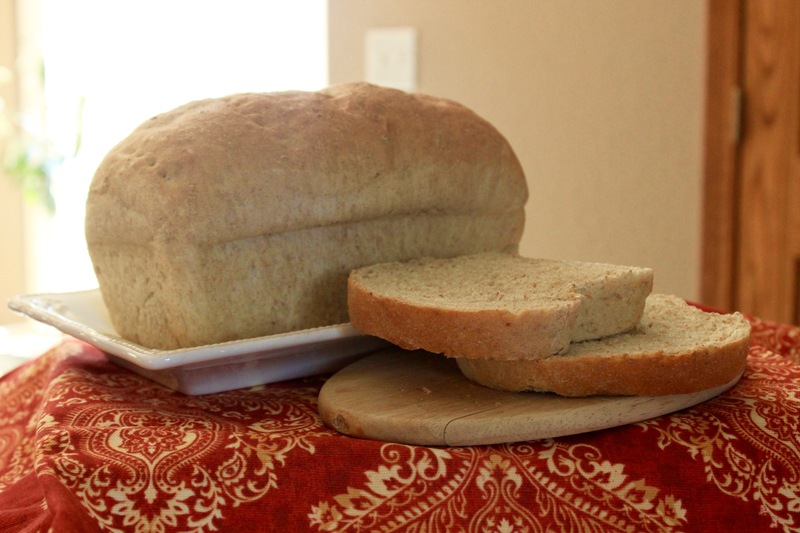 Even though they live in the States now, Rebekka feeds her family similar to the way she was brought up in Europe…..which consist of lots of homemade bread! I could handle that! So she’s got lots of practice making it at least once or twice every week. 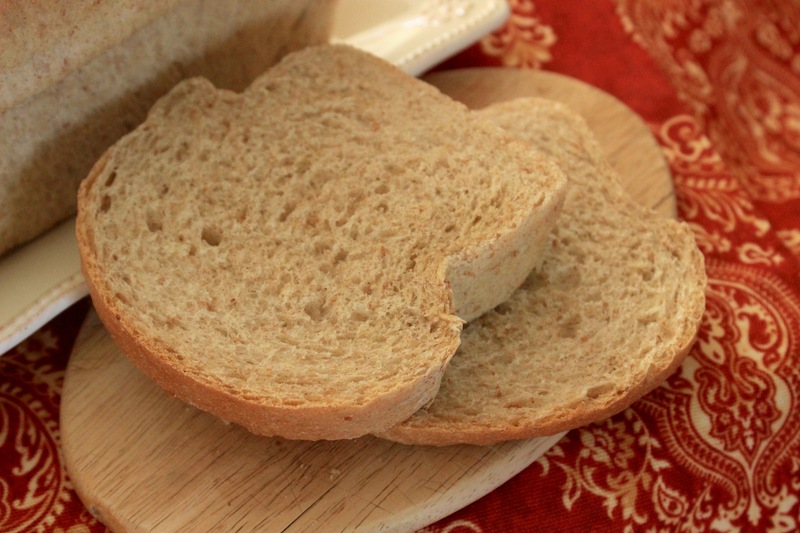 Her bread is perfect every time and I’ve come to the conclusion that its more in the technique than it is in the recipe because her recipe is just as basic and simple as they come and yet she has consistent, amazing results every time! I’ve learned a lot of helpful tips from watching her and thought maybe you could learn something too! I’ve included a few step-by-step pictures of what she does, when, and how. Mix dough according to recipe and place in sink filled 1/4 full with warm water. 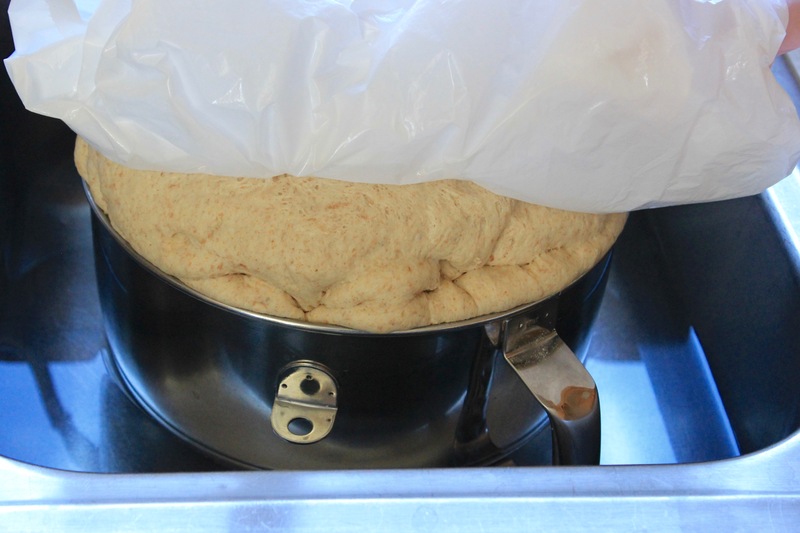 This keeps the dough moist as it rises. Divide dough into 4-5 equal pieces and pat out into rectangle. Roll up tightly. Rebekka was so fast and skillful at this, I had to ask her to slow down. …and still her hands are blurred! =) Pinch edges together and fold under. 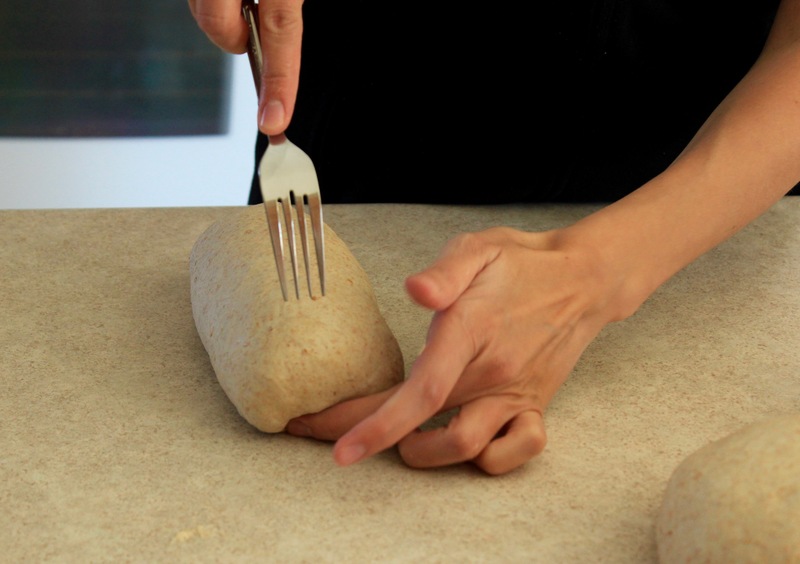 Take fork and prick each loaf 4 or 5 times, going almost all the way through. 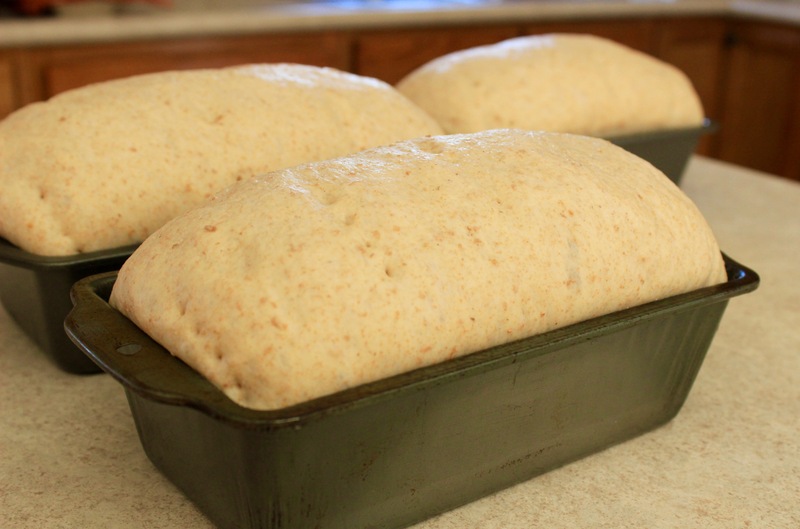 Cover with plastic and let rise for 45 minutes or until loaves have doubled. Bake in preheated oven until loaves have reached a golden perfection! Cool on wire racks. Slice and enjoy! Its perfectly delicious. In large Kitchen Aid or Bosch mixer, place warm water, brown sugar, and yeast. Let stand for 10 minutes or until bubbly. Add oil, salt, and whole wheat flour. Mix until smooth. Slowly add remaining flour until dough is slightly sticky. 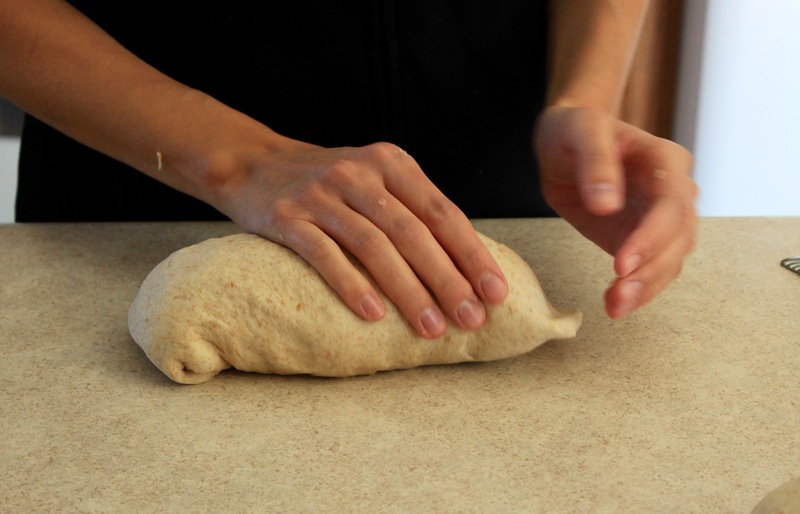 Remain mixing on low speed to knead dough for 5 minutes. Cover with lightly greased plastic – place in sink of warm water. Allow to rise for 1 hour or until doubled. Punch dough down and rise again for 45 minutes. 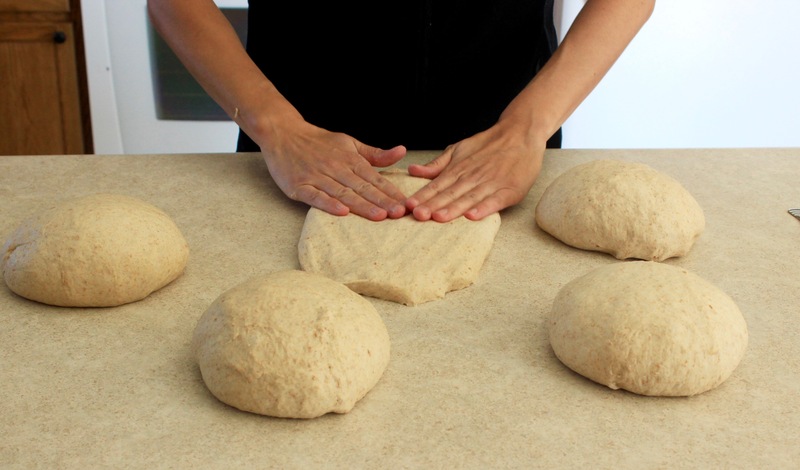 Divide dough into 5 loaves (4 if using larger pans) with hands, pat each piece into rectangle, roll up tightly pinching the seems at the edges. Take fork and prick dough 4-5x. Place into greased pan. Repeat with remaining loaves. Preheat oven to 350º. Bake for 27-30 minutes or until lightly browned. Just finished making this………and it’s amazingly soft, fluffy n light! My family devoured it n raved over n over. 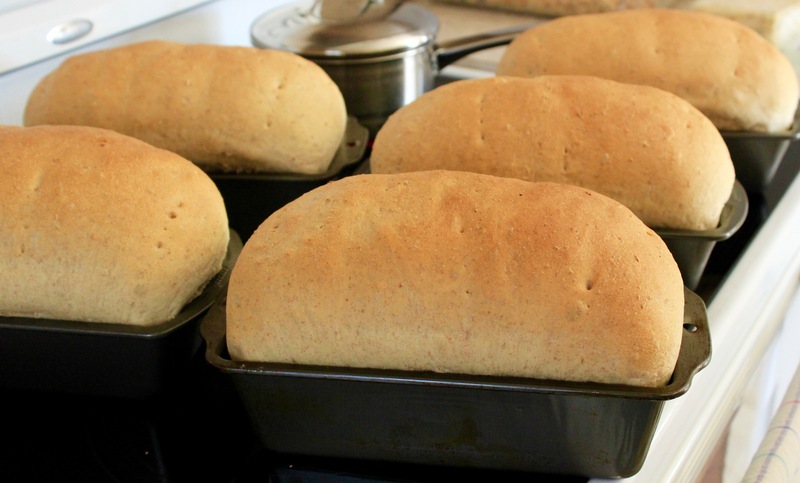 I’ve tried a good bit of bread recipes over the last 10 years n this one is hard to beat. Thanks for sharing.